Nagomi products feature Kimono fabrics made in Japan, combining ancient Japanese traditional arts with contemporary uses. Our selection is made with Chirimen crepe fabric (polyester=contemporary) that has a vintage kimono motif such as bamboo, crane, florals (=traditional). The fabric has luxurious textural wrinkles and is soft, but more durable and easier to care for than silk. In addition to the fabric bags made entirely in Japan, we offer intriguing jewelry pieces that encapsulate the kimono fabric inside clear acrylic, these are made in Canada! 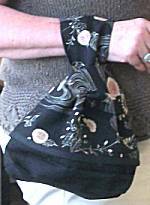 The elegant Nagomi Wrist Bag is easy to wear on your wrist as shown, or carry by hand. The shape will vary according to the personal items you put inside. One loop slips over the other to close...then lift that loop over to open and access what you need. Great for dancing and parties when you would like two free hands! Beautiful and intriguing little bag is made with Chirimen crepe fabric in traditional Japanese kimono print, black background with flower motif in light taupe with bits of plum and yellow color. Fabric-only construction to softly hold your personal items. There is a long and short open loop on the top...the short loop is slipped over the long, and then the long loop goes over your wrist for elegant carrying (and no one can open it easily from there). When not in use, can be folded flat in drawer or luggage too! Interior lined in black, no pockets or zippers. Interior useful space measures approximately 8 x 6 x 5 inches. A piece of kimono fabric is encapsulated in acrylic all around to form piece that is 1-3/8 inches tall, 5/8 inch across, and viewed front and back. Suspended from cord made with Chirimen kimono fabric for soft draping line and additional color! A short back chain and spring ring clasp, length adjusts 18-20 inches. Pendant colors are pastel yellow, peach and green. Cord is darker ivory, navy, red, green pink and orange. Kimono printed fabric is surrounded by clear acrylic for earring drop, that can be viewed from both front and back. The kimono piece measures 1-3/8 x 5/8 inch, earring drops 2-1/8 inches long on sterling earwire. The kimono colors feature a pastel blush that is salmon pink-into-peach. Pendant colors are salmon pink and blush orange. Cord is vibrant red, ivory and splash of sky blue. Beautiful little handbag is made with Chirimen crepe fabric in traditional Japanese kimono print, with elements of flower, fan and lace in the motif. Colors are muted seafoam aqua/green, mustard yellow, green, black, silver and gray. The shape depends on your personal items inside! The "pointy" bottom construction will make it a vertical tulip, but lay a flat item like wallet or glasses case along the bottom, and will become more squared. Measures about 8 x 7 x 5 inches, closes with button and loop over the top. Interior lined in black with small open pocket. No zipper. There is also a wide open pocket on the outside. Shorter 14 inch fabric handles for hand-hold carrying only. Beautiful and intriguing little bag is made with Chirimen crepe fabric in traditional Japanese kimono print, rich floral with colors of purple, red, rose pink, coral orange, green, mustard and ivory. Fabric-only construction to softly hold your personal items. There is a long and short open loop on the top...the short loop is slipped over the long, and then the long loop goes over your wrist for elegant carrying (and no one can open it easily from there). When not in use, can be folded flat in drawer or luggage too! Interior lined in black, no pockets or zippers. Interior useful space measures approximately 8 x 6 x 5 inches. Pendant colors are red, coral and green. Cord is brick red, brown, black, mustard and green. Pendant colors are red, orchid, pale pink and lemon. Cord is dark navy, ivory and a bit of green. Read about what others think of Nagomi accessories! Instead of reviews for a specific product, this is a place to share about the designer line in general.